We’re in the 2nd half of the South Central Sports League – 2018 Basketball Season. Please come out and support our Youth! The Get Paid! 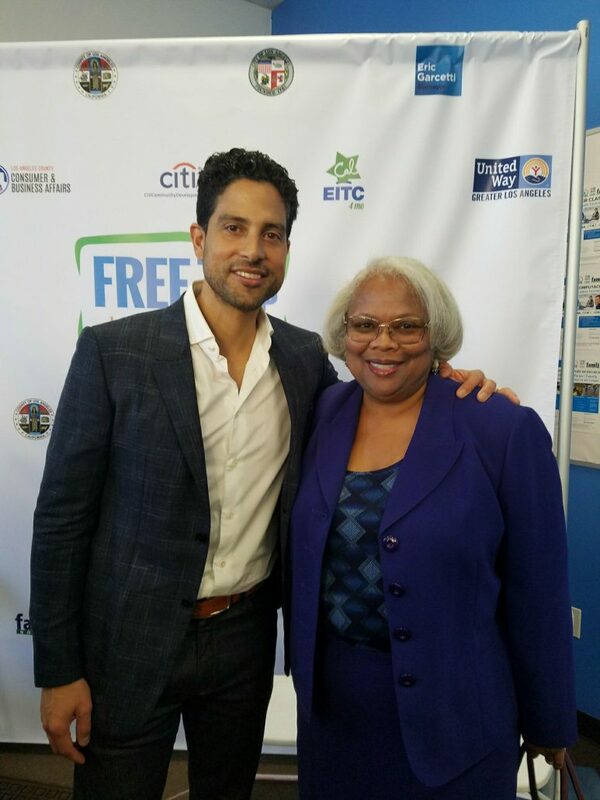 Work Ready LA Job Fair was held this past Saturday, February 24, 2018 at Los Angeles Trade-Tech Community College. Six of our Youth participated in the hiring event, and All Peoples also had a booth for our YouthSource Center. Thanks to everyone that participated in the event! We’re celebrating with our 14 Graduates on completing their Financial Literacy Courses. Topics included Budgeting, Credit Building, Savings and Investments, and Identify Theft. All Peoples in partnership with Broadway Federal Bank provided bank accounts for all participants and matched all money saved during the 6-week financial course. Don’t miss out on this great course! Please contact Financial Coach Noel Lopez at (213) 747-6357 ext 133 for more information! https://allpeoplescc.org/wp-content/uploads/FinancialLiteracyGraduates-e1519156250394.jpg 233 355 Shalanda Mays https://allpeoplescc.org/wp-content/uploads/LogoNewFull_Final_2_520x156-300x90.png Shalanda Mays2018-02-20 12:02:472018-02-20 12:04:33Financial Literacy Graduates! Congrats Stephanie and Brian on your acceptance letters! This past November, our Community Members came together for #GivingTuesday to support our “Tomorrow’s Leaders – College Readiness” Program. Donations went towards Books, College Tours, Bus Transportation, College Workshops, and Application Fees. We’re proud to report that we’ve received 9 admission acceptance letters for our All Peoples “Tomorrow’s Leaders” Program participants. The colleges include Cal State LA (4), Humboldt State University (2), East Bay (1), Cal State Channel Islands (1), and Mt. Saint Mary’s Univ. (1). Our College Advisors are continuing to promote the new initiative taken by the city Los Angeles College Promise and make sure that our Youth know that “College is Possible”. Our College Advisor David Solis holding a Parent Workshop. Congrats to our Youth and we would like Thank our Community for your continued support! During the 2nd week of February, we held SYEP (Summer Youth Employment Program) orientation. CRCD and YouthSource Staff held mock interviews with YouthSource Participants during Professional Enrichment Training. We look forward to sharing updates on the progress of our YouthSource Participants. Thanks to Big Sunday for their donations of professional attire for our YouthSource Participants. Open positions are still available for Youth interesting in the Summer Youth Employment Program. Please contact Adrian Rios at (213) 747-6357 ext 151 or arios@allpeoplescc.org for more information. All Peoples Community Center offers FREE Tax Preparation! 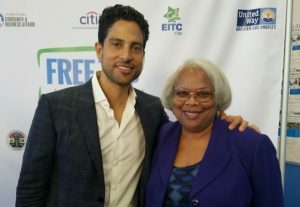 Adam Rodriguez and Executive Director Saundra Bryant at a Press Conference to promote Free Tax Services and EITC. Congrats to Mayra Ramos who obtained employment through our WorkSource Center! Pictured left to right: Jocelyn Rodriguez (Mayra’s Career Coach), Jessica Fuentes (Career Coach managing TLH program), Mayra Ramos (WSC Participant). Mayra Ramos encountered the Vernon-Central/LATTC WorkSource Center in August of 2017 while seeking immediate employment services. Mayra migrated from Honduras in search of stability, safety, and better employment opportunities. However, seeking employment in the United States with English as a Second Language made the outcome all the more difficult. She’d enrolled in English as a Second Language and Intermediate computer courses to enhance her skills and compete with other job seekers. Her previous work experience consisted of care-giving and housekeeping, but she was searching for a position that provided professional growth. Upon enrolling at the Vernon-Central/LATTC WorkSource, Mayra was assisted with resume development and was referred for the Targeted Local Hire Program (TLH) with the City of Los Angeles. Shortly after attending the TLH orientation, Mayra was selected from the pool of candidates. She immediately submitted her resume for consideration for a position with the Public Library department. Mayra was assisted in preparing for the interview and was provided interview clothing by Dress for Success. The hiring process with the city of Los Angeles has an extensive waiting period however, Mayra refused to settle for another employment option and kept hope alive for this opportunity. On December of 2017, Mayra received the best Christmas present: a New Hire Offer letter with the City of Los Angeles as an Administrative Assistant with the Los Angeles Public Library. Mayra began the New Year in process for the opportunity she’d been seeking. Her new employer contacted her early January 2018 with her assigned work site and work schedule. Mayra’s start date was scheduled for January 22, 2018. If you’re currently in need of assistance, please contact our Career Coach Jocelyn Rodriguez at (213) 747-6357 ext 132. The money raised will go to benefit family recreational activities. We will be selling: Nachos, Hot Dogs, Pizza, Soda and More!